Packaged petroleum products are not the same as packaged petroleum fuels. Both are described below. Appendix H provides standard reference data on various petroleum containers. Packaged petroleum products include lubricants, greases, hydraulic fluids, and other specialty products that have been packaged at the procurement source. They are received directly from the vendor or issued through general supply depots or supply points following MILSTRIP. Packaged petroleum fuels include fuel in reusable containers of 500 gallons or less. The containers used most often are 5-gallon cans, 55-gallon drums, and 500-gallon collapsible drums. Fuels are usually issued in bulk. The need to transfer bulk petroleum fuels to packaged containers depends on such operational factors as the quantities required for daily operations, the capabilities of the units to receive and store fuels, the existence of a bulk distribution system, and the tactical situation. This container is used to issue small quantities of fuel. A more complete discussion of its use is given below. The 5-gallon fuel can as shown in Figure 22-1, is made of 20-gage sheet steel. The welded body is clinched to the bottom chime by a double seam. The head, welded to the top of the body, is fitted with three carrying handles and a 2-inch threaded flange with closure assembly. A vent tube is welded to the underside of the head and connected to a small vent hole in the flange. The vent makes the product flow freely when it is poured from the can. The can is closed by a threaded plug which screws into the flange. The plug is attached to the can by a swivel wire, a swivel-wire hasp, a connector link, and a cotter pin. It is fitted with a synthetic-rubber, gasoline-resistant gasket. The plug can be removed from the flange, and a flexible spout (inset of Figure 22-1) can be put in its place to help pour product from the can. A cap and screen can be screwed into the end of the spout to screen out gross sediment. The 5-gallon can is used to issue small quantities of fuel to using units. It is especially useful when conditions are such that the container must be carried by hand. There are a number of checks you should make to see if 5-gallon cans are serviceable. These checks are discussed below. Paint Condition. Check the condition of the paint on each can. Mark the can if it needs to be painted. Dents. Check the number and depth of dents on each can. If you count no more than six dents and each is less than one-half of an inch deep, you can use the can without repairing it. If you count no more than four dents and each is less than 1½-inch deep, you can use the can if the dents can be removed without weakening the metal or container construction. Reject a can as nonrepairable when dents over one-half of an inch long are present along the chime, when dents have caused the metal to rupture, or when dents exceed in number or depth the limits set above. Contamination. Check the interior of each can for general cleanliness. Cans containing removable contaminates should be cleaned thoroughly before they are used. Label a can as nonrepairable if it contains a residue of asphalt or tar or a similar substance that you cannot remove. Rust. Check the inside and outside of each can for rust. Cans with moderate exterior rusting are repairable if you can buff or sandblast the rust off without weakening the metal. Label the can nonrepairable if there is a great deal of rust on its outside. The inside of the can must be free of loose rust before it can be used. Label the can as nonrepairable if there is so much rust on the inside that you cannot remove it with solvent or caustic washing. Holes. Check each can carefully for holes. A hole, rip, or rupture anywhere in the can (except the handle assembly) makes it nonrepairable. Flange. Check the condition of the flange on each can. Ensure it is securely seated in the head and that the flange threads are in good condition. Cans with crossed, stripped, rusted, or worn flange threads are classified as nonrepairable. Filler Plug, Gasket, and Swivel Wire. Check each can for missing or defective filler plug, gasket, or swivel wire. Mark the can to show the repair it needs. Vent Tube. Check the condition of the vent tube in each can. Clean clogged vent tubes. Use cans with broken or missing vent tubes only in an emergency. Handle Assembly. Check the condition of the handle assembly. You can use cans with holes, dents, or rips in the handles if you can carry them without hurting your hands. If the handle needs repairing, mark where the repairs are needed. Classify cans with missing, broken, or badly smashed handles as nonrepairable. The cans must be thoroughly inspected before and after cleaning. You can clean the cans by sloshing solvent around inside and allowing them to drain into a waste fuel container. This method removes most of the residual product, sand, and other foreign matter from the cans. The 5-gallon cans as shown in Figure 22-2, must be filled to a level between one-fourth and three-fourths of an inch below the lowest point on the closure threads. The can holds approximately 5.14 gallons of product when filled to the highest level (one-fourth of an inch below the lowest point of the closure threads). All markings on 5-gallon cans should be in three-fourths of an inch letters. Place the marking on the can as shown in Figure 22-3. The 55-gallon steel drum is used to issue fuels and lubricating oils to units. It cannot be hand carried like the 5-gallon can. The 55-gallon drum as shown in Figure 22-4, is made of either 16- or 18-gage, hot-rolled sheet steel. It has rolling hoops and an enameled exterior finish. The drumheads are held to the cylindrical body by double-seamed chimes. Chimes of the 16-gage drum are reinforced by a strip of sheet steel (inset of Figure 22-4). Two flanged closures, a 2-inch plug, and a 3/4-inch plug (vent) are mounted in the top head of each drum. The 16-gage drum is more durable than the 18-gage drum and can be reused. The 16-gage drum can be identified by the letter "O" embossed on the head of the drum. The 18-gage drum is primarily a disposable shipping container. Product can be dispensed from the 55-gallon drum by a hand-driven pump mounted in the 2-inch closure. A drum-unloader suction stub can be connected to the suction hose of a power-driven pumping assembly to empty the drum. When the drum is in a horizontal position, a drum faucet can be installed in the 3/4-inch closure to draw off small quantities of product. The 55-gallon drum has an authorized capacity of 54 gallons for fuels with flash points lower than 80° F and 55-gallons for fuels with flash points higher than 80°F. The closures consist of a threaded flange pressed into the drumhead, a male threaded plug, and a synthetic-rubber gasket. Both closures on any one drum should be of the same type, either Rieke or Trisure. A Rieke plug can be screwed into a Trisure flange, or vice versa, but it will usually leak. The two designs are not the same, and part of one cannot be used with part of the other. The plug and gasket must match the flange as shown in Figure 22-5. The 55-gallon drum is used to issue fuel and lubricating oil to using units. It can also be used in most situations. However, it cannot be used when the terrain or tactical situation makes it necessary to deliver fuel in containers that can be hand carried. There are a number of specific checks you should make to see if 55-gallon drums can be used. These checks are discussed below. Initial Inspection. The quickest and most economical way to inspect the drums is to check them for obvious major defects. Major defects which make drums nonrepairable are a great amount of rust inside or outside; a badly bent shape; damage to either flange, many holes or large holes; or residue of asphalt, tar, or similar substance that you cannot remove. Detailed Inspection. If you find no major defects during the initial inspection, give the drum a second, more detailed inspection. Ensure each drum meets the minimum serviceability standards described in Table 22-1, page 22-6.
a. Numerous small dents are acceptable. b. Condition of paint of no importance. a. Up to 3 inches in depth if not more than six dents in body. b. No restriction on length. a. None resulting from rust. b. Other up to three-fourth inch in greatest dimension are acceptable if not more than four holes in the body. Exterior: Must be free of severe pitting that would weaken drum structure. Should be tight on both types of drums. Reinforcing metal strips should be in place on 16-gage drums. 16-gage. None greater than one-fourth inch in depth with no restriction on length or number. 16-gage. No holes allowed and no ruptures acceptable if they separate reinforcement from chime. 18-gage. None greater than three-fourths inch in depth and 5 inches in length with no more than four dents per chime. See information for body, above. No defective threads, gasket seat, or weld. Exterior: Moderate rusting if gasket set and threads are not impaired. Interior: See information for body, above. Must be restorable to approximate original contour. Up to 2 inches in depth if not more than two dents per head. b. Up to three-fourths inch if not more than one hole per head. c. None located within 2 inches of flange weld or chime. Should be restorable to approximate original shape. None greater than five-eights inch in depth, no limitation in number. Up to three-fourths inch, not to exceed three holes per hoop. Up to 2 inches in depth, not to exceed three dents per weld. The drums must be cleaned by the method described for cans. After cleaning a drum, inspect it with an extension light to ensure the inside is clean and free from rust. If you find sediment, clean the drum again as described above. If it is still not clean, classify it as unserviceable. When you are sure the drums are clean and free from rust, put bung plugs, vent plugs, and gaskets back in place. Insert and tighten the plugs in the drums unless you are going to fill them immediately. If you store the drums temporarily, tighten the plugs by hand. If you store them for a long time, tighten plugs with a wrench. To make sure that there is enough vapor space in 55-gallon drums, only 54 gallons of light product or 55 gallons of heavy product can be put into each drum. A light product is one which gives off flammable vapors at or below 80° F, and a heavy product is one which gives off flammable vapors above 80°F. If you have no metering devices, fill the drums to the level shown in Figure 22-6. If you are going to put 54 gallons of product in a drum, fill it to a level 2 inches below the head. If you are going to put 55 gallons of product in a drum, fill it to a level 1½ inches below the head. All markings on 55-gallon drums should be at least three-fourths of an inch. Mark the top head of the drum as shown in Figure 22-7. The 500-gallon collapsible fabric drum can supply fuel to isolated ground troops. It can be towed short distances by trucks, carried by trucks, or carried by aircraft. The 500-gallon collapsible drum as shown in Figure 22-8, is a nonvented container made of fabric impregnated with fuel-resistant, synthetic rubber. The cylindrical body is of four-ply fabric; the convex ends of six-ply fabric. The drum has a closure plate on each end. The plates are tied together inside the drum with support cables so that they do not expand in length when the drum is filled. Each closure plate has a swivel ring with two anchor shackles. A lifting sling or towing and lifting yoke can be attached to these shackles. It can also be used to tie a drum to a vehicle. The drum is filled and emptied through an 1½-inch quick coupling elbow coupler valve and check valve adapter in the front closure plate. When the pressure control is used for the filling operation, the 1½-inch discharge hose of the control is attached to the elbow coupler valve. When the pressure control is not used, the hose of the pumping assembly is attached directly to the elbow coupler valve. A filled drum is about 5 feet 2 inches long and 4 feet 5 inches in diameter; it weighs about 4,000 pounds. It is designed for a regular working pressure of 4 to 5 PSI and a top working pressure of 45 PSI. The collapsed drum can be moved by truck. Each drum is used for only one type of fuel. Repair kits for the 500-gallon collapsible drum can be used to make temporary repairs. Pressure control. The pressure control is used to keep from pumping too much fuel into a nonvented collapsible drum. Too much fuel could cause the drum to rupture. For information on filling collapsible drums using the pressure control, see Chapter 19. Figure 22-9, shows the pressure control. Figure 22-10, shows it connected for filling a drum. Elbow coupler. The elbow coupler as shown in Figure 22-11, has a 2-inch, cam-locking female coupling for connecting to the drum and a 1½-inch, cam-locking female for connecting to the hose. The FARE system includes an elbow coupler with a 2-inch fitting for connecting to the hose. The elbow coupler has a valve to shut off the flow of the fuel into and out of the drum. Emergency repair kit. The emergency repair kit is used for temporary repairs only. For detailed information see, Chapter 12. 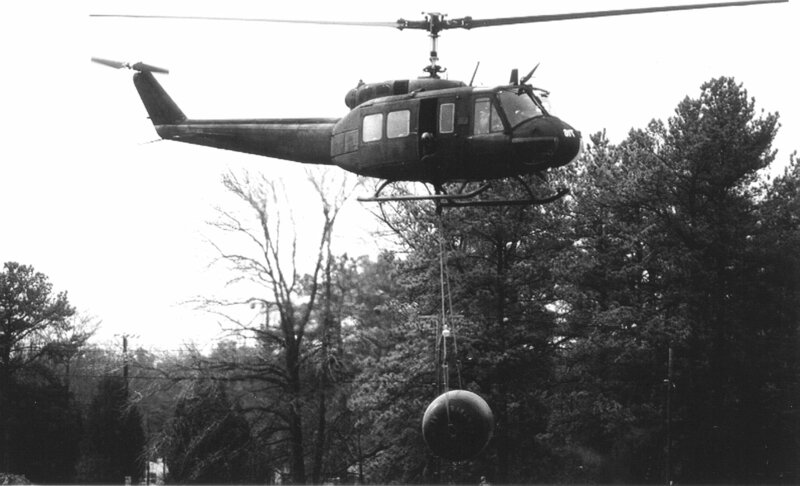 The 500-gallon collapsible drum is used to supply fuel to isolated ground troops. The drum can also be used for storage. Filled drums can be towed or rolled by hand a short distance to a dispensing area, used with a tie-down kit to convert cargo trucks into fuel carriers, and delivered by aircraft. Towed by truck. A filled drum can be towed a short distance to a dispensing area by a cargo truck as shown in Figure 22-12. A towing and lifting yoke must be used, and the drum must not be towed over sharp objects or rough ground. NOTE: The yoke can be used for lifting the drum only when the drum is empty. Carried by truck. Collapsible drums can be carried from a filling site to a dispensing area in a 2½- or 5-ton cargo truck or on a stake and platform trailer. Tie-down kits as shown in Figure 22-13, are used to secure the drums during transport. A filled 500-gallon drum weighs about 4,000 pounds. Do not exceed the weight limitations of the vehicle. Carried by aircraft. Filled drums can be dropped by parachute, delivered by aircraft sling-load as shown in Figure 22-14 or transported as air cargo. The drums must not be free-fall airdropped. Rigging procedures in FM 10-564/TO 13C7-37-1 must be followed. The serviceability of 500-gallon collapsible drums can be determined by inspecting the items listed below. See TM 10-8110-201-14&P for more information. Body Fabric. Check the body fabric for holes, cuts, tears, deterioration, or leaks. The drum can be used if the rubber coating only is worn from the body fabric. Closures. Check the front and rear closure rings for cracks, leaks, or missing cap screws. Check the front closure plate for stripped threads or a missing pipe plug. Coupler Elbow Valve Assembly. Check the coupler elbow valve assembly for loose or missing gaskets or a corroded or stuck valve. Also check for cracked or missing parts. Pressure Control. Check the pressure control for body cracks. Also, check for loose or missing cap screw and nuts. The 500-gallon collapsible drums are sent to the general support maintenance repair facility for cleaning. For procedures for filling 500-gallon collapsible drums, see Chapter 14. All markings on 500-gallon collapsible drums can vary between 2 to 5 inches. Mark both ends of the drum as shown in Figure 22-15. Put the filling date on the drum when you are using it for temporary storage of petroleum fuels. Bulk petroleum products include those petroleum products transported in pipelines, tankers, tank cars, tank vehicles, and other bulk carriers. Containers discussed in this section are used to store and deliver bulk petroleum products in quantities over 500 gallons. For maintenance procedures see Chapter 13. The 3,000-gallon collapsible fabric tank is made of single-ply, elastomeric-coated nylon. It has four carrying handles, a filler/discharge assembly, and a vent fitting assembly. The tank is issued with a hose and gate valve assembly and emergency repair items. When filled, the tank is about 12 feet 6 inches square and 4 feet high. The filler/discharge assembly as shown in Figure 22-16, is located on top of the tank. It consists of an access door fitting, a 4-inch suction stub, an oval closure plate, a 4-inch flanged adapter coupled to a 4-inch elbow fitting, and a 4-inch dust cap. The vent fitting assembly as shown in Figure 22-17, is located near the center of the top of the tank near the filler/discharge assembly. It consists of a vent flange attachment and a 2-inch, quick-disconnect, male coupling half connected to a 2-inch, quick-disconnect, female coupling half. It also consists of a 2-inch dust cap, a 2-inch vent pipe, a flame arrester, and a pressure relief cap with gasket. The pressure relief cap of the vent assembly opens automatically when the vapor pressure inside the tank reaches 10 PSI. The 3,000-gallon collapsible tank comes with a hose and valve assembly to help transfer the product because this tank is issued as a separate item and not as part of a system. The assembly consists of 4- to 3-inch reducer; a 3-inch, wire-reinforced hose assembly (4 feet long); and a 3-inch gate valve. The 4-inch female end of the reducer is connected to the 4-inch elbow fitting of the filler/discharge assembly on the tank. The 3-inch male end of the reducer is connected to the 3-inch hose assembly which, in turn, is coupled to the 3-inch gate valve. The 3,000-gallon collapsible tank is used for temporary storage of liquid fuels where larger collapsible tanks are not practical. With the hose and valve assembly attached, the tank can receive and dispense bulk petroleum fuels. The tanks is generally used in small bulk petroleum operations. The 10,000-gallon collapsible fabric tank looks a lot like the 3,000-gallon collapsible tank, It consists of either one or two filler/discharge assemblies, a vent fitting assembly, a drain fitting assembly, and various hoses and valves. The 10,000-gallon tank is made of single-ply, elastomeric-coated nylon with six carrying handles. The tank also has emergency repair items. When filled, the tank is about 20 feet 6 inches square and 4 feet high. Filler/discharge assemblies. The filler/discharge assemblies as shown in Figure 22-16, are on top of the tank. They are similar to that of the 3,000-gallon collapsible tank. Vent fitting assembly. The vent fitting assembly as shown in Figure 22-17, is located on top of the tank. It is just like that of the 3,000-gallon collapsible tank. The pressure relief cap of the vent assembly on the 10,000-gallon collapsible tank opens automatically when the vapor pressure inside the tank reaches 10 PSI. Drain fitting assembly. The drain fitting assembly is used to remove water. It is located on the bottom of the tank. It consists of a vent flange attachment, a drain fitting, and a plug and chain. The assembly has an 8-foot length of 3/4-inch, nonwire-reinforced hose assembly with male fittings on both ends and a ½-inch, rising-stem gate valve. These items are attached to the drain fitting assembly to help drain water from the tank. The 10,000-gallon collapsible storage tank is used to store petroleum products. It is usually a part of the FSSP, but it is also issued as a single item for additional bulk storage. The 20,000-gallon collapsible fabric tank is primarily used in the FSSP. Its description and use are covered below. The 20,000-gallon collapsible tank as shown in Figure 22-18, is made of elastomeric-coated nylon. It has 12 carrying handles, two filler/discharge assemblies with access doors, a vent fitting assembly, and a drain fitting assembly. When filled, the tank is about 28 feet long, 24 feet wide, and 5 feet high. Filler/discharge assemblies. The two 4-inch filler/discharge assemblies are identical to those on the 3,000- and 10,000-gallon collapsible tanks. They are located on top of the tank, 6 feet from each end and 4 feet from the centerline. The assemblies are catercornered from each other. Vent fitting assembly. The vent fitting assembly is identical with those on the 3,000- and 10,000-gallon collapsible tanks. It is located in the top center of the tank. The pressure relief cap of the assembly opens automatically when the vapor pressure inside the tank reaches 10 PSI. Drain fitting assembly. The drain fitting assembly, located on the bottom of the tank, is used to remove water. The assembly is identical to those on the 3,000- and 10,000-gallon collapsible tanks. The 20,000-gallon collapsible tank is used to store bulk petroleum products. The primary use is in the FSSP. It is also issued as a single item for additional bulk storage. The 50,000-gallon collapsible fabric tank is used for storing liquid fuels in large bulk petroleum operations. It has several uses. The 50,000-gallon collapsible fabric tank is made of single-ply, elastomeric-coated nylon. It has 18 carrying handles, two filler/discharge assemblies with access doors, a vent fitting assembly, and a drain fitting assembly. The tank also has a hose and valve assembly and emergency repair items. When filled, the tank is about 65 feet long, 25 feet wide, and 6 feet high. Filler/discharge assemblies. The two filler/discharge assemblies as shown in Figure 22-16, are located on top of the tank. One is located at each end so that the tank can receive and discharge fuel from both ends. Vent fitting assembly. The vent fitting assembly are shown in Figure 22-17, is centrally positioned on top of the tank. It is the same as that on the 3,000-gallon collapsible tank. The pressure relief cap of the vent assembly opens automatically when the vapor pressure inside the tank reaches 10 PSI. Hose and valve assembly. Because the 50,000-gallon collapsible tank is issued as a single item of equipment and not as part of a system, it has a hose and valve assembly to help transfer product. The assembly consists of a 4-inch, wire-reinforced hose assembly (10 feet long) and a 4-inch gate valve. The female end of the 4-inch hose assembly is connected to the 4-inch elbow fitting of the filler/discharge assembly on the tank. The male end of the hose assembly is coupled to the 4-inch gate valve. The 50,000-gallon collapsible tank is use to store liquid fuels in large bulk petroleum operations. With the hose and valve assembly attached, the tank can receive and dispense fuels at temporary beachheads and at intermediate points along trunk hoseline and pipeline systems. The tank may also be used for temporary storage at supply installations and airfields until permanent facilities can be built. The tanks are also used in tactical Class III supply points to issue bulk petroleum to tank trucks and tank semitrailers. As part of the Class III supply point, the tanks provide maximum flexibility in the handling of various fuels (MOGAS and JP-8). The 210,000-gallon collapsible fabric tank is also called the BFTA. It stores bulk petroleum products. The BFTA is made of single-ply, elastomeric-coated nylon. The tank has a vent assembly, two filler/discharge assemblies, and two drain assemblies. When filled, the tank is about 69 feet long, 69 feet wide, and 6 feet 9 inches high. Filler/discharge assemblies. The two 6-inch filler/discharge assemblies are located on top of the tank. One assembly is located at each end of the tank so that fuel can be received and dispensed at both ends. Vent fitting assembly. The vent fitting assembly is identical to those on other collapsible tanks. It is located in the center of the top of the tank. The relief valve opens when the internal tank vapor pressure reaches 10 PSI. Drain fitting assemblies. The 2-inch drain fitting assemblies are located on the bottom of the tank, one at each end. The assemblies are used to drain water from the tank. The 210,000-gallon collapsible tank is used to store liquid fuels in large bulk petroleum operations. The tanks are used primarily in the TPT and are issued as separate items of equipment. Emergency repair items are issued with each collapsible tank. See Chapter 12 for a description of emergency repair items.